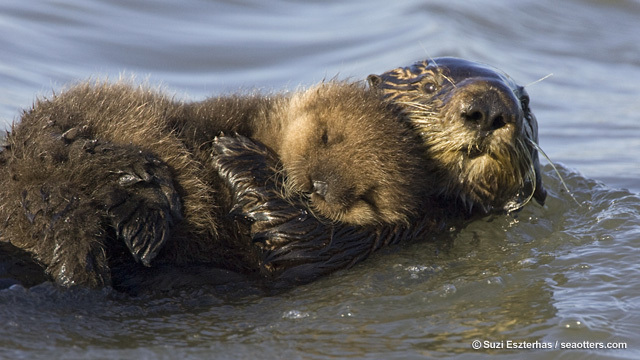 A new study conducted by researchers from UC Santa Cruz, U.S. Geological Survey and the Monterey Bay Aquarium finds that sea otter moms risk their own survival to raise pups. Just how hard do otter moms work? The study, published in the Journal of Experimental Biology, reveals females with 6 month old pups spend up to 14 hours a day foraging, while consuming nearly twice as much food as females with no pups. The overall health of adult females, especially along the Central Coast of California, has concerned researchers in recent years. These findings could account for their poor condition and higher mortality rates. Sadly, females that are in poor condition are more vulnerable to infection and disease, and more likely to abandon their pups as they aren’t able to provide for them. With only 3,000 southern sea otters alive today, every otter counts! Energetic demands of immature sea otters from birth to weaning: implications for maternal costs, reproductive behavior and population-level trends. Abstract: Sea otters (Enhydra lutris) have the highest mass-specific metabolic rate of any marine mammal, which is superimposed on the inherently high costs of reproduction and lactation in adult females. These combined energetic demands have been implicated in the poor body condition and increased mortality of female sea otters nearing the end of lactation along the central California coast. However, the cost of lactation is unknown and currently cannot be directly measured for this marine species in the wild. Here, we quantified the energetic demands of immature sea otters across five developmental stages as a means of assessing the underlying energetic challenges associated with pup rearing that may contribute to poor maternal condition. Activity-specific metabolic rates, daily activity budgets and field metabolic rates (FMR) were determined for each developmental stage. Mean FMR of pre-molt pups was 2.29±0.81 MJ day−1 and increased to 6.16±2.46 and 7.41±3.17 MJ day−1 in post-molt pups and dependent immature animals, respectively. Consequently, daily energy demands of adult females increase 17% by 3 weeks postpartum and continue increasing to 96% above pre-pregnancy levels by the average age of weaning. Our results suggest that the energetics of pup rearing superimposed on small body size, marine living and limited on-board energetic reserves conspire to make female sea otters exceptionally vulnerable to energetic shortfalls. By controlling individual fitness, maternal behavior and pup provisioning strategies, this underlying metabolic challenge appears to be a major factor influencing current population trends in southern sea otters (Enhydra lutris nereis).